Rongling Wu is developing a technique that will help farmers predict how fast crops will grow. And thanks to an $855,000 grant from the National Science Foundation, he will soon use the same technology to speed the process of creating new lifesaving drugs. Using massive amounts of statistical data, he’s built a computer modeling technique that helps predict how a plant or animal’s bodily functions and growth are affected by complex genetic interactions. “The very important thing about this approach is how universal it is,” says Wu, a professor of statistical genetics in UF’s Institute of Food and Agricultural Sciences. Every day, thousands of researchers toil away at uncovering the process by which genes control and create life. Every discovery brings understanding, but the search will be virtually unending – life’s processes bring chemical structures and actions that are nearly boundless in their variety. So Wu’s process focuses on the big picture. In short, he watches what happens on a large scale, and then statistically correlates that with genetic interactions he knows are taking place on a small scale. Wu’s technique, called functional mapping, produces a computer model that uses known gene interactions along with expected environmental conditions. He began his research more than a decade ago with plant variations. For example, he examined how soil nutrients interacted with genetic traits of black cottonwood trees to produce differing growth rates. His work eventually looked at how drugs interplay with human genomics, a field known as pharmacogenetics. 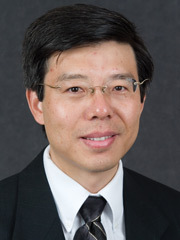 Wu and his colleagues published the first major analysis of functional mapping models of human drug responses in the journal Bioinformatics. Wu has also received an $855,000 NSF grant to construct a user-friendly functional model for anyone pursing pharmacogenetic research. The programming may be especially useful in light of worldwide efforts to match genetic profiles with physical traits.